Cork 6-9 Dublin 3-5 Cork U16s produced an impressive display to complete a Rebel double over the Dubs in Birr on Saturday to be crowned All Ireland Champions. For many of the squad the heartbreak of a single point defeat to Galway in the 2012 decider was finally laid to rest as they deservedly overcame a gallant Dublin side to bring back the All Ireland title to Leeside for the first time since 2008. Dublin who were 6-22 to 0-2 victors over Cavan in the semi-final demonstrated the threat which their forward line possessed when they struck for their first goal with barely a minute gone. Cork responded with 3 points from “Player of the Match” Eimear Scally and points from Hannah Looney and Laura Cleary to hit the front as they began to dominate possession around the middle sector with Eirne Ní Dheasmuinigh and Niamh Duggan were winning their midfield battle. Wing forward Kate Leneghan struck for the first of her 3 goals at the end of the first quarter to set the Rebels on their way. 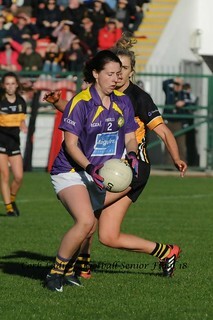 This was soon followed by an Eimear Scally goal as the young Rebels threatened to cut loose. Dublin to their credit responded with a goal of their own to cut the deficit to just three but Kate Leneghan got on the end of a fine Cork move to notch up her second green flag and extend Cork’s lead. Two points from Eimear Scally and one from Abbie Scannell put Cork in a commanding 3-7 to 2-2 lead at the half time whistle as Dublin were finding it increasingly difficult to break down a Cork defence that were combining very effectively as a unit and providing the platform for the impressive Cork attack. Goals from Eimear Scally and hat trick hero Kate Leneghan in the opening minutes of the second half effectively sealed Dublin’s fate as despite their best efforts this was a mountain too high for them to climb. Cork introduced their Captain Aishling Kelleher for Caoilinn Hickey and Kate Ó Keeffe for Jess Tonks as they remained in control of the game. 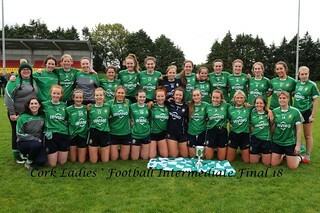 Dublin showed great character as they battled gamely to get back into the contest forcing a number fine saves including a super penalty stop from Olivia Cahill who had a great game in the Cork goal. Cork substitute Kate O’ Keeffe had to leave the field due to an injury within minutes of her introduction and was replaced by Emma Spillane. Rebecca Walsh was introduced for Evie Casey as Cork emptied their bench. As the game entered the final quarter Cork reintroduced the irrepressible Kate Ó Keffee for Abbie Scannell and the Dromtarriffe girl who had a great season for the Rebels made a driving run from the heart of the Cork defence to link up with her forwards and finally crash home a great goal to seal a wonderful victory for the Cork girls.